“Drawing from Life and Death”, Hung Liu’s latest cycle of paintings feels, at first, like a departure for the 61-year-old chronicler of Chinese history. But is it? People are absent, and so is her usual narrative structure. But like the elegiac, rivulet-stained oil paintings of 19th century and pre-Revolutionary women that, for decades, she has been painting from period photos, these pictures carry a heavy load: the weight of mortality. Liu grew up in China during the Cultural Revolution and witnessed all kinds of suffering; but she has never, as far as I know, taken on mortality directly. 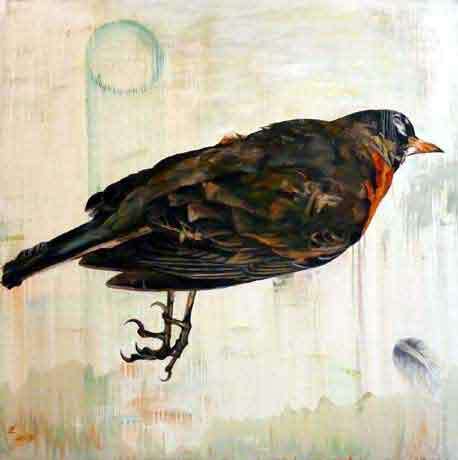 She does so here using animals as surrogates in pictures that are painted with an expressionistic handling. They are tempered by dripping lines, calligraphic marks and abstract surface gestures that instead of grounding the pictures in space they erase it altogether. Thus, her animals are akin to specimens. They float on the surface, apparently dead, but not quite inanimate. 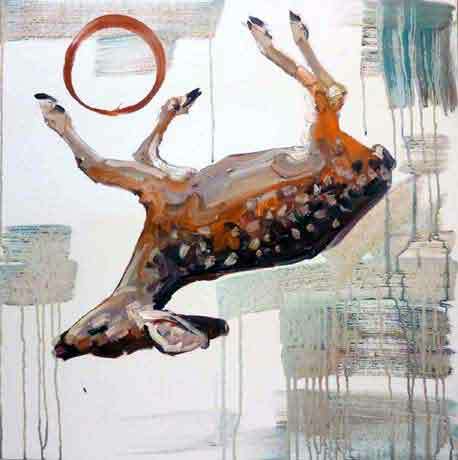 Among the animals depicted are deer that were freshly killed by cars near the artist’s home in the Oakland hills, a robin that fell out of the sky into her studio parking lot and a human corpse viewed at a local medical facility. 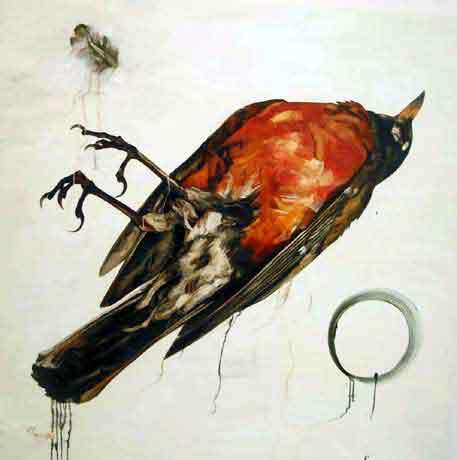 Liu photographed them and made paintings from the photographs; but apart from her bravura wet-on-wet technique, what distinguishes these pictures is the forensic method she used to document the evidence: circling around the fallen animals from above and snapping pictures. 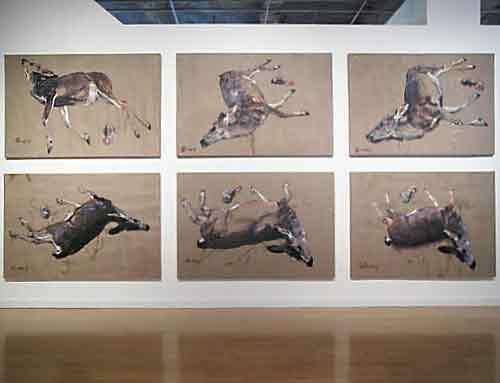 Thus, the different views of a dead fawn that we see in Qi Bu (Seven Steps to Heaven), a sextet of 44” x 66” paintings mounted in two rows, are something of a forensic experience, too, as we circle the animal exactly as the artist did, seeking clues from its splayed legs and the rocks nearby. 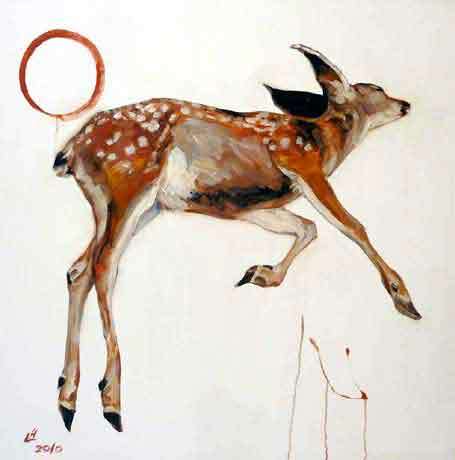 In Liu’s cosmology, life is a fluid exchange, a cycle of birth and decay signified by her repeated use of the circular enso – a Zen calligraphic mark that symbolizes an “endless cycling, encompassing everything and nothing,” according to Nick Stone who wrote those words in his preface to Deer Boy (Magnolia Editions), an artist’s book that Liu published last year with a poem by Michael McClure. Another Liu trademark, weeping vertical stains, is an ever-present trope in this series, underscoring the tragedy of so much Chinese history. Kelly maintains that the dissolution of the collective fever-dream that was Mao’s regime threw China into a state of confusion from which it is still recovering; and it is within this hypnagogic realm, between the 50-year snooze of state-dictated consciousness and whatever comes next, that China now operates. Beyond its obvious allusions to mortality, Drawing from Life and Death is, ultimately, a metaphor for this limbo condition. It’s something that Liu, an immigrant with close ties to China, understands intuitively. Liu Liu, Drawing from Life and Death, through May 22, 2010 at Rena Bransten Gallery, SF. Learn more about Hung Liu. Michael McClure reads from his latest collection, Mysterioso, Tuesday May 4, at 7 p.m. at City Lights Bookstore, SF. I see deer hit by cars on Skyline and live deer and new fauns every spring in the park in back of my house – this will change my view of all of them. Fascinating exhibit even if a bit disturbing. The deer. The robin. The unliving engage my mind in troubling ways. I say Bravo!